This study evaluated the effect of climatic conditions on the occurrence of Eimeria sp., strongylids and Moniezia sp. by analyzing the excretion of eggs and oocysts in the feces of sheep. In all, 3,509 coproparasitological examinations were performed after the monthly collection of feces of 121 sheep for 29 months. The meteorological data collected were rainfall, insolation, evapotranspiration, relative humidity, and temperature. Principal component analysis was performed to summarize the number of climatic variables. To evaluate the climatic vectors that influenced the variables, Eimeria sp., strongylids and Moniezia sp., a spatial projection of the ordination of vectors on the first two principal components was performed. 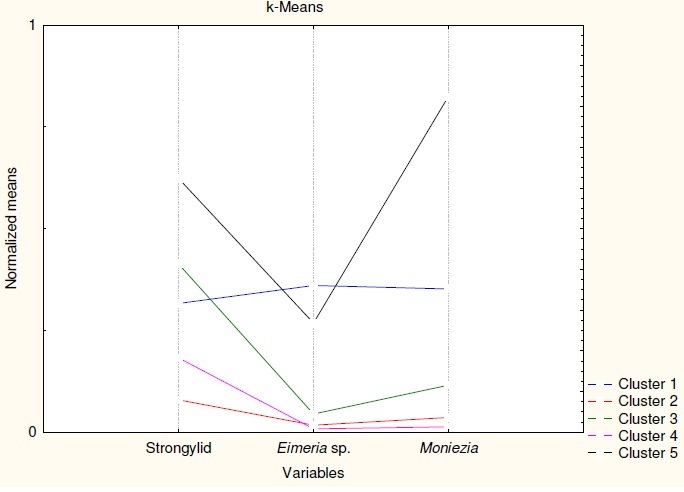 To evaluate the mean values of the variables, Eimeria sp., strongylids and Moniezia sp., a cluster analysis was performed (k-means clustering), according to the categories. An association of Eimeria sp. and strongylids with relative humidity and rainfall was observed. Moniezia sp. was also related to the minimum temperature. The prevalence of Moniezia sp. was the least affected by relative humidity, rainfall, insolation, and evapotranspiration. The highest counts of endoparasites were observed in the offspring category and in the months of higher rainfall. Doutor em Parasitologia, Docente do Departamento de Parasitologia, ICB/UFMG. Mestre em Zootecnia, Docente do IFNMG. Doutor em Zootecnia, Docente do Departamento de Ciências Agrárias, Unimontes.